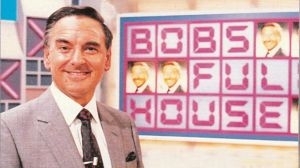 Bob's Full House was a popular quiz programme hosted by Bob Monkhouse which was based on the popular game 'Bingo' and aired on BBC1 from 1 September 1984 until 27 January 1990. On Bob's Full House four contestants competed to fill in their Bingo-style card. Correct answer to questions covered up a number but incorrect answers causes players to sit out the next question (this was classified as getting wallied).